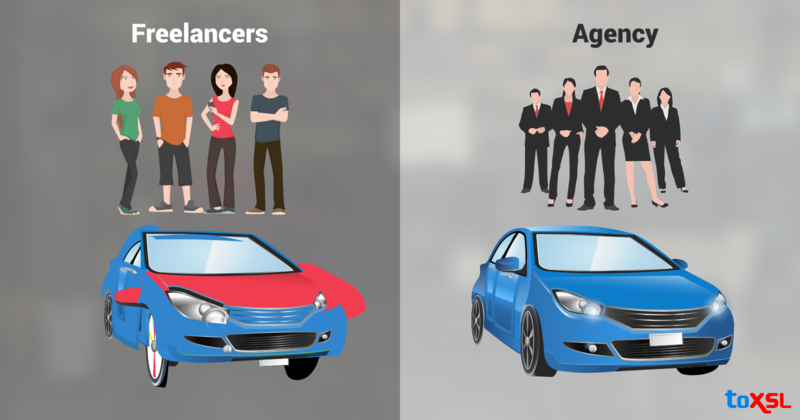 Why You Should Hire an Agency Rather Than an Individual Freelancer? Various organizations have been outsourcing a ton of their business forms for a long time now, however, many business organizations are now acknowledging how incredible impact outsourcing can have on their organizations and how many benefits they can capitalize on. That is the reason outsourcing different business operations are becoming increasingly famous nowadays. However, the most important question that numerous business owners ask themselves before outsourcing is whether to hire a professional agency or individual freelancers for their particular projects. The majority believe that hiring an agency will bring about unnecessary expenses since agencies charge more for their services than freelancers do, as they have to take care of their overhead expenses. In the below sections, we will endeavor to objectively exhibit the two sides of the argument and show that still after one weighs up the upsides and downsides, you bring about less risk and get better value for money working with a digital agency rather than a freelancer. Freelancer: In spite of the fact that not every time, there is a sizable risk when working with a freelancer that he or she is working on your project as a side gig or after they are done with their "real" job. This, obviously, implies that you get second best as your freelancer works on your project when drained, after a complete 8 long hours of other work. He cannot be completely gainful working during nights and weekends. On the other hand, if the specialist does not have some other work aside from your project, what happens to your timings, milestones, and deadlines on the off chance that he becomes ill, has family issues, is in an emotional mess, or in the event if anything else happens. Taking a project off of one freelancer and passing it to another would require a huge amount of tolerance, time and obviously money to transfer the knowledge and get the new person up and running. Practice demonstrates that on projects spanning over weeks or months, it is unreasonable to expect that a freelancer will continuously work beyond normal working hours. Agency: In contrast to freelancers, an organization has the assets and the labor to schedule and substitute its workforce with the least risk to the task and its deadline. When you work with an experienced agency like ToXSL Technologies, you get a project manager and also the programmers, designers and QA testers. The project manager creates, maintains, and ensures the team remains on track with weekly sprints and monthly milestones. We give our customers a detailed roadmap of the project before we begin and know that we will get to the end goal regardless of any unforeseen circumstances that may come along. If the developer is not available for any of the multiple reasons, we rapidly substitute him with another one from our huge team. The knowledge transfer happens easily and rapidly as we have standardized and pre-agreed approaches to writing, commenting and committing code. We utilize libraries and frameworks that are known to every internal developer so adding or replacing team members is a breeze. Actually, in 99% of cases, the customer would not know when that happens, in light of the fact that toward the day's end the project proceeds on schedule and completes on time. Freelancer: On the off chance that you work with a freelancer, be set up to complete a considerable measure of the testing yourself. Obviously, great coders compose great code and test it well, however, it has been observed on numerous occasions, that when a developer sees the same project for a long time, sooner or later they quit seeing evident blunders, bugs or UI inconveniences. Additionally, developers are not prepared to test for fringe, or edge cases, or to assume unlikely use cases and situations or to attempt and break their own code, which they believe is perfect. The main goal of a developer is to finish the project and get paid as soon as possible. It has also been observed that a freelancer is not even close to being in a good position to test his code properly, particularly when it comes to mobile application development and the need of testing the application on an extensive range of different devices. All the standard gadgets and browsers need to be thought about as the majority of the users do not have the same type of computer or browser setup as the developer. Agency: The upside of working with an agency with regards to quality are: code survey, dedicated testing by a professionally trained QA department, the closeness of designers and UI experts who can point out navigational issues and obviously the access to an expansive number of testing devices. When it comes to the latter, ToXSL Technologies boasts no less than 20 distinctive android devices, around 10 unique iOS devices including mobiles and tablets and a whole range of devices in between, including Windows phones, Blackberry Smartphones, and different wearables like android and apple watches. Testing and quality assurance of the project with regards to a digital agency is certifiably not an afterthought yet a ponder and principal part of the project commencement. At the time the project manager drafts the scope of work and project milestones, the QA begins drafting conceivable test cases and test scenarios. The project team chooses which unit tests the software engineer will code into the application and the testers begin considering automated testing situations that are created alongside project development and utilized vigorously in the last “clean-up” and release stages. Freelancer: A single designer can depend just on himself. So when you hire a freelancer you hire his knowledge and his past experiences, however just his. Some may feel that in these days of Google and StackOverflow the fact that the developer is flying solo should not matter. However, Googling can carry you just to a specific point. This situation calls for different coders working alongside the single developer who could approve his code and choices and who could offer fresh ideas when required. Agency: At ToXSL, we build up our skill sets in teams. Each team has a team leader whose part is to dependably remain sharp and be over everything important occurring in his technology in the world and it is his duty to impart it to the whole team. We have seen on numerous occasions that when an issue strikes one team member, others come in and brainstorm a solution altogether. We endeavor hard to build up extensive ability, set the tone for the whole development process and ensure everybody embraces and continues utilizing best practices for code writing and maintenance. Freelancer: While this is subjective, in general, freelancers have much less overhead costs than a professional agency and they are often the least expensive option. Keep in mind, however, that you get what you pay for and outsourcing to more than one freelancer can quickly run up a large tab. Agency: For any particular service, it is generally more expensive to work with an agency than to hire an individual freelancer. However, as agencies can offer packaged multiple services together and operate effectively as a team in order to complete the deliverable in the shortest possible amount of time, it can be argued that they actually offer the highest value for your budget. Therefore, working with an agency can prove to be the cost-effective alternative in the long run. At last, you get what you pay for. We as a whole wish to pay almost nothing and get the entire world in return which rarely works. Numerous years of experience demonstrate that working with organizations exceptionally limits the numerous dangers associated with offsite mobile and web development and for the large majority of projects is completely the correct decision to make. What are your thoughts on working with a freelancer and a full-fledged development agency? Share your thoughts with us in the comments section below.